The Mike Francesa-Michael Kay New York radio ratings fights are getting tighter and tighter all the time. 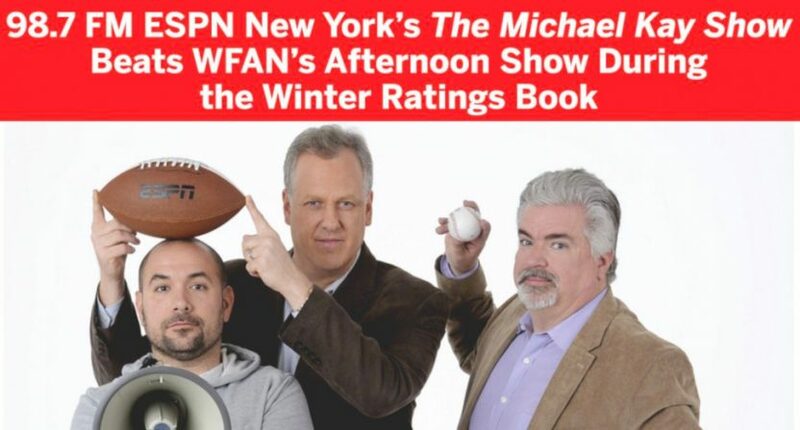 In the last ratings book of 2018, WFAN’s Francesa narrowly beat ESPN New York Kay (6.4 to 5.8 in the men 25-to-54 demographic with WFAN’s separate streaming factored in, 5.9 to 5.8 without it), and Kay won the months of December and January (his second and third monthly wins ever against Francesa; the January one saw Kay post a 5.8 to Francesa’s 5.7 with streaming, 5.0 without). The local afternoon sports radio ratings wars resulted in another close, complicated battle in the quarterly winter “book,” which covers Jan. 3 to March 27 and was released by Nielsen Audio on Monday. Mike Francesa of WFAN edged Michael Kay of ESPN New York among men ages 25-54 if one includes both over-the-air and live streaming data, which is WFAN’s preferred method, 6.2 percent of the audience to 5.9 percent. Without WFAN’s streaming audience, Kay had the edge, 5.9 to 5.5, but ESPN’s figure includes both its over-the-air and streaming numbers, because unlike WFAN, it carries the same ads on both platforms. You know, Michael, there’s only room for one New York radio host to just make things up. And what’s particularly dumb about this PR move is that there’s legitimate good news for the Kay show; Kay closed the gap from the winter book (streaming included) from six points to three points, and beat Francesa without WFAN’s streaming included (something he didn’t do in the winter book). But the “beats” narrative (included in ESPN’s release, which doesn’t even mention WFAN’s streaming numbers) is counterfactual. And what’s unfortunate about this is that the PR overreach really misplays the good news here for Kay, which is about closing the gap. Francesa has repeatedly dunked on Kay as an unworthy opponent over the years, including “burying in the ratings” and “if you’re gonna come after us, then you gotta bring more than pea shooters.” That narrative sure doesn’t seem to still hold. But that gets lost in the discussion when you’re making a “beats” claim that the data doesn’t support. The overall news here still isn’t great for Francesa. It’s positive for him that he recovered for an overall win after losing January to Kay, and that he improved his rating to 6.2 with streaming included from the 5.7 he had then. But the 6. is well behind the 6.8 Francesa posted early in his WFAN return. His numbers are trending down, and Kay’s are rising. But that doesn’t rise to “beats” yet, no matter what the ESPN release may say.